My auntliness increased by 7lbs, 10ozs and is 20" longer, too! Harrison Christopher was born Wednesday afternoon. While his birthday debut started one way, he was not enjoying it, so it was completed via c-section. My sister is OK, but having a few problems, so she was in the ICU until Friday afternoon. This was not our favorite thing, but we have done our best to navigate our way through this unexpected and different path. We were finally able to hold Harrison Thursday, and it was wonderful. Now I just keep knitting little hats for his precious little head, wait my turn to snuggle him, and take as many photos as possible. I felt a bit nervous as I made my way to the school where I would be a weaving demonstrator. After all, I was listed as a guest artist on the flyer for the event. Artist seems like such a grand title, and I felt like a fraud. I tried not to think about it, and focused on what I would be weaving. I had my Ashford rigid heddle, my Schacht Cricket, and my Schacht inkle looms set up and ready to go. The parents were interesting, and had many questions. One asked how much the blanket cost, and when I did not have an answer, told me that I ought to know. She kept circling and I think that maybe she was waiting for me to name a price. A father got very close, watched intently for several minutes, and likened the process to computers with the on/off options. Another parent asked many questions about the fiber arts, had interesting things to say, and hired me to make a case for her Kindle. That was unexpected, but very nice. She did not want to give any suggestions on color, as she just wants me to be inspired and let my creativity lead the process. It helped that I had Bruce along for moral support. However, that also meant that the kids got to weave on my Cricket a little bit. For the most part, they listened and did well. There were a few almost too shy and nervous to try, and one who was very confident in her abilities and thought that she should be given free rein over all of my looms. The kids were funny, and it seemed like a couple felt a real connection to weaving. One declared, "I am going to ask my parents to get me one of these machines!" At the end of the night, a first grader gave Bruce a hug. Well, we made it through the full-moon weekend, and it was something else. Very little went as planned, and it was both too wild and too quiet. A perfect companion for both the crazy and the nothingness, was making things. Of course, scattered throughout the weekend were tiny baby bunnies. They are quick, easy, and fun. 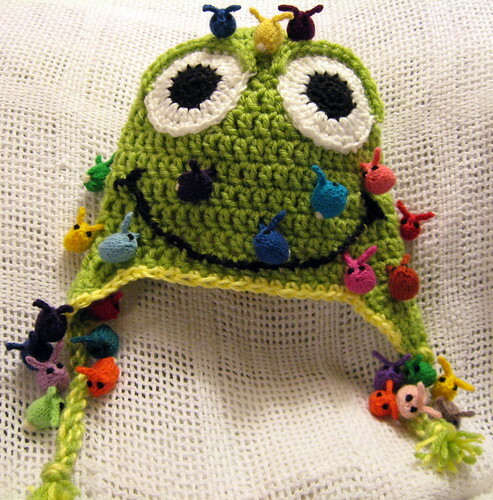 Then I decided to work on a little frog hat that my mom asked me to make for my soon-to-be-here nephew. None of the patterns I found was really doing it for me, and that is part of why I hadn't made it before now. In the end, I decided to use the owl hat pattern as a guide, and I think I have something that works. Speaking of Rufus, we got good news about him; he turned. Not only that, but my sister's blood pressure is back where it should be. We are so very thrilled. Now that he is headed in the right direction, his birthday is planned for the 18th, or sooner if he gets impatient. A few weeks back I heard of a search for a weaving demonstrator at a local elementary school as a part of their Youth Art Month celebration. The first thing I did was get the details, because I wanted to be sure that they were looking for something I could do. Since they only needed me to weave and I would not have to give a presentation, it seemed like something I could agree to do without taking on too much. Figuring out what to weave was the next step. I could have left the current project on my Ashford, but I did not want to do that. I probably never showed this piece when I first started it. The plan was to make a blanket by weaving two panels and sewing them together. I had received a bag of yarns that I might not have bought on my own, and was stumped with how to use them, and this blanket seemed to be the answer. I used the plain, smooth, acrylic yarns for the warp, and then alternated blocks of two different textured yarns for the weft. When I was about 90% done with the first panel, I lost confidence. I worried that it was not going to work out the way I had planned, so I set it aside and could not make myself return to it. The decision to demonstrate weaving was just what I needed to make myself finish the blanket. I figured that if it worked well, I would have one more piece to display my weaving. If it did not, I would know and be done with it. Now that it is done, I am glad that I stuck it out and finished the blanket. This will probably be a gift, but I have not decided on the recipient just yet. It is nice and soft, and the different textures add to its touchability. My nephew was even able to overlook the fact that it is not in his favorite colors and declare that he wanted to be the first to fall asleep under the blanket. Yay! My computer is well again; the new LCD cable was just what it needed. It was such a little bit, but it caused me big troubles. In honor of the little bits, I am still knitting tiny baby bunnies.